This post is part of a new series – Homekeeping Basics. In the series I’ll talk about ingredients, products, and some simple, basic homekeeping 101 sorts of things. I hope you enjoy it! Let’s start with a product I think every one should have in their home – castile soap. Castile soap is an all natural, vegetable-based product made primarily of coconut and olive oils. Instead of using synthetic chemicals as ingredients, they use naturally found and sourced ingredients. A lot of soaps (dish and otherwise) contain petroleum and other toxic, caustic ingredients. By switching to castile soap for cleaning you’re using an effective and safe alternative. My favorite is brand is Dr. Bronner’s – I love the citrus version. It smells fresh, clean, and citrusy. Dr. Bronner’s also comes in unscented, almond, lavender, tea tree, peppermint, and a few other scents. If you have never heard of Dr. Bronner’s you can purchase online through Amazon or I purchase at my local Wal-Mart, Target (in the natural beauty section), or Whole Foods. 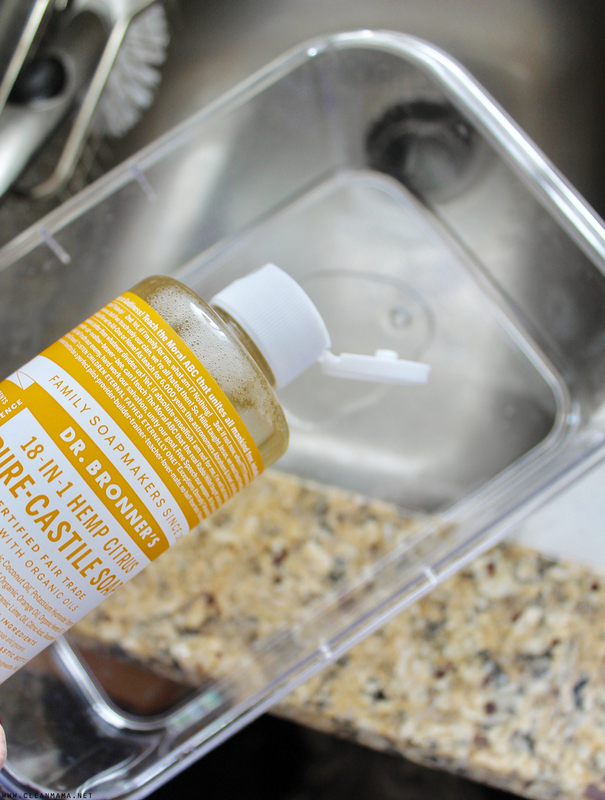 What’s so great about castile soap? It’s affordable, extremely concentrated, natural, and gentle and it cleans beautifully! It’s a great multi-purpose cleaner. It’s so safe that you can use it to clean fruit and vegetables and to brush your teeth. One word of caution – castile soap and vinegar don’t mix. The acid in the vinegar mixes with the castile to make a sludge. I do use one or two recipes with a teeny tiny bit of castile soap and vinegar and haven’t had a sludgy reaction, but just be careful as you’re mixing up cleaning concoctions. Have you purchased my new book, Simply Clean? It will change the way you clean in the best possible way! I just bought my first bottle a few months ago and am so happy to see this post! Now I have so many uses for this big bottle!! I bought my first bottle a few months ago. I’ve only been using it to make foaming hand soap with my essential oils. Now I have SO many other ways to use it! thank you!!!! This will be such a useful series for me! Cleaning was never really modeled for me. I never figured out how to properly sweep with a broom and dustpan until I was in my 20’s! 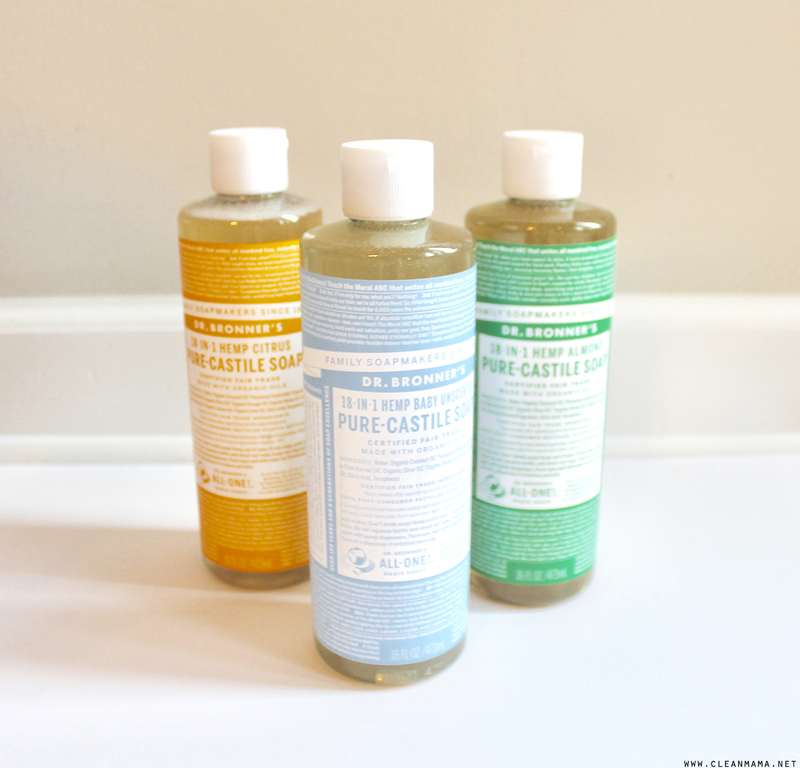 Also this Castile soap post was timely for me! No wonder my floors had a bit of film on them when I mixed peppermint Castile with vinegar! Thank you for being such a valuable resource! When I was very young, I was obsessed with horses. My parents allowed me to play at the local (rich folks) riding stable, and since I was there all day anyway, and he didn’t want me getting hurt by the high-spirited horses, Mr Roy taught me to clean bridles and saddles. For most of my life I knew Castile soap as “the white saddle soap you use to get the horse sweat off the saddles”! I didn’t know it was used for other purposes until much later in life. It really makde my very dry skin soft as well… not dry and itchy like regular commercial soap. Great new series. I have everything but don’t always know how to use it effectively. Really didn’t know wht to do with castile soap except bth in it. Thanks! Thank you! I have a big bottle under my sink, now I can effectively use it! Have you used it to wash laundry? Lisa Bronner says you can use it in place of conventional laundry detergent with vinegar in the rinse cycle. I haven’t tried it yet, but plan on it soon. I love your nightly kitchen sink routine! Looking forward to your new book! I haven’t…but I like the grated for laundry soap – but give it a try! Care to give a tip on the best (your preference) scents to buy when stocking up? It’s hard to go through all the recipes in your first book and sort out which scents are really needed and which can be substituted with another when time is a-ticking in the store! Thanks! I never knew not to mix with vinegar. I have done this and it smells so weird – like Worcestershire sauce (I think). I know that’s weird! But I never connected this! Thank you! I love this soap- usually use the peppermint but just bought the citrus. I always forget how many amazing uses there are so I am glad you posted all these ways to use the soap. Thank you! I need to order your book for sure and share with my blog followers! I have grated castile soap. Not liquid. How can I use it to make your recipes? Unfortunately, it won’t work the same unless you use the liquid – sorry! If it’s really concentrated, do you mix it with water? What is the ratio? The ratio depends on what you are cleaning – Dr. Bronner’s has ratios for just about anything! Dr. Bronner’s has a detergent called Sal Suds that can be mixed with vineger. I use Sal Suds where I can’t use castile. We just put in new hardwood. I was told by the manufactioner not to use water. However, the solution they recommend seems to then show smudges more so. Any ideas please. Is it oiled hardwood? That’s typically the type of floor that they say not to use water. It is great to kill aphids on plants, spiders and ants in my kitchen. Use several applications to get them under control. I have washed my hair, washed the dog. just google it. you will find an amazing list of uses. Being that it’s oil based, have you found that it’s hard on your pipes when rinsing rags or cleaning around drains? Not at all, it’s completely biodegradable!